The bacteria that cause cavities feed off of the sugar and starch we eat and, in turn, produces enamel-eroding acid. The acid present in soda (both diet and regular), citrus fruits, pickles, and tomatoes also weaken the enamel. Try limiting your sugar intake to no more than 13 grams per day. According to an article published in BMC Public Health, limiting your sugar intake will significantly reduce your risk of oral health problems. Refined carbohydrates like bread, pasta, chips, and crackers convert to sugar in your mouth, so it is best to limit or avoid them. When your teeth are exposed to sugar and acid constantly, bacteria have a better opportunity to grow. If you cannot significantly limit your sugar and refined carbohydrate intake (which is difficult to do), you should at least limit how often you snack. Drink these beverages through a straw to limit the amount of acid your enamel is exposed to. You should also avoid sipping an acidic drink (like coffee) slowly throughout the day. Instead, drink your beverage with your meal and rinse your mouth with water once you are finished. According to research, the casein and whey protein in many types of cheese can help to reduce enamel demineralization. Chewing on cheese will also stimulate saliva flow, which helps to wash away acid and bacteria. If you’ve packed some string cheese in your lunch today, be sure to eat that last. A rough toothbrush can damage your enamel. Be sure to use a soft-bristled toothbrush and be mindful about how much pressure you are applying while brushing. Brush in small, circular motions rather than back and forth. Check your toothpaste for the ingredient glycerin, which can cause a film to form over the teeth that block the minerals in your saliva from strengthening your enamel. Calcium phosphate and fluoride, the ingredients in remineralizing gels, have been scientifically proven to strengthen tooth enamel. Remineralizing gels often come in the form of a pen applicator or in teeth whitening trays that you can apply to your teeth at home. Chewing sugar-free gum can help to stimulate saliva production, which washes away bacteria and the acid it creates. However, gum that contains sugar will completely cancel out this effect. Look for sugar-free gum with xylitol, a natural sweetener, listed as one of the first ingredients. Once your tooth enamel begins to erode, you may start feeling sensitivity when you eat sweets or foods that are too hot or too cold. You may also start to notice cracks or chips in your teeth. If the erosion is very advanced, you will notice indentations on your teeth (“cupping”). 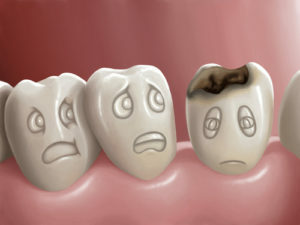 But what can you do once your enamel has already begun to erode? Because it is not made up of living cells, it cannot repair itself. If the erosion is not too severe, dental bonding can be done to protect the teeth. In more advanced cases, treatments such as porcelain veneers or crowns can be applied to cover the teeth, protecting them and reducing sensitivity as well as making them look healthier. If you have any concerns about your oral health or are interested in a cosmetic dental procedure, please schedule a consultation by calling (310) 273-0111. This entry was posted on Wednesday, November 7th, 2018 at 4:25 pm	and is filed under Dental Bonding, Porcelain Veneers. You can follow any responses to this entry through the RSS 2.0 feed. Both comments and pings are currently closed. Does your jaw ever feel sore when you wake up in the morning? If so, you could have bruxism. People with bruxism frequently grind or clench their teeth together. Since this can significantly damage the teeth, here are some tips to help you stop grinding your teeth. If bruxism has already led to notable tooth damage, dental bonding or porcelain veneers can restore your smile. Your jaw and mouth muscles help you chew and speak, so it isn’t surprising that they are some of the strongest muscles in your body. Factors such as stress, anxiety, or anger can cause you to clench your jaw from time to time, which means that these incredibly strong muscles are putting excessive force on your teeth. On occasion, this doesn’t cause serious damage, but for people with bruxism, the regular clenching or grinding of teeth can affect not only your dental health but also your overall well-being. Consistent wear can lead to cracks, chips, tooth loss, headaches, earaches, receding gums, inflammation in the jaw, and lockjaw. Grinding teeth is particularly common at night. Since you can’t control your movements while you’re sleeping, a mouth guard can protect your teeth at night. While this will not prevent teeth grinding, the mouth guard will take the brunt of the force so that your teeth do not have to. A mouth guard can be purchased at a local drug store, but it is better to have one custom made to fit your mouth. 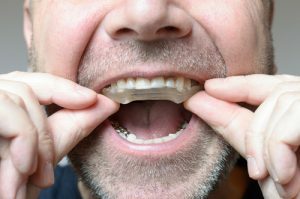 Dr. Sands can devise a custom mouth guard for bruxism if you need it. 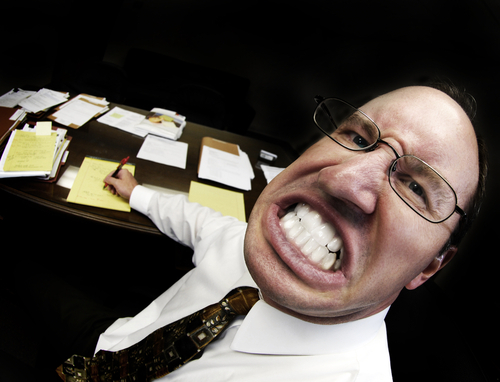 Bruxism is often triggered by stress or anxiety. Find ways to reduce stress in your life so that your muscles are less likely to take it out on your teeth. Many people find that practices such as meditation, yoga, or even taking a hot bath can alleviate stress and provide relaxation. Overworking the jaw can increase tension in it, leading to jaw clenching or teeth grinding. Avoid foods that are difficult to chew, such as tough meat or chewy candy, as well as chewing gum. Alcohol can increase the urge to clench your teeth, while caffeine can increase tension and jittery movements such as tooth grinding. 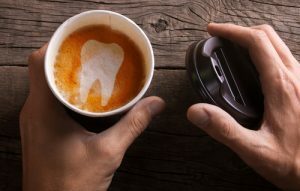 Both alcohol and caffeine can increase symptoms of bruxism and should be avoided, especially in the afternoon and evening hours. Though the two are not guaranteed to coincide, many people with bruxism also have sleep apnea. Getting treatment for sleep apnea (such as with a CPAP machine or mouth guard) can also be effective for preventing teeth grinding. Jaw exercises and muscle relaxants can help relax the jaw. Gently massage the jaw, neck, and face to relieve tension, and consider asking a chiropractor or physical therapist for help with some jaw exercises. It can even help to apply a hot, wet washcloth to the sides of your jaw for several minutes at night before bed to relax the muscles. If any tooth damage has occurred due to bruxism, Dr. Sands can use dental bonding or porcelain veneers to restore your teeth. Dental bonding uses a cosmetic resin that is bonded to the tooth, sculpted and molded, then hardened until it matches your enamel. Porcelain veneers are thin sheets of porcelain that are cemented to your teeth to improve their form, appearance, and function. Both treatments can improve the appearance and function of teeth that have been worn down by teeth grinding. Dr. Kevin Sands can offer additional recommendations for bruxism treatment and prevention of teeth grinding during your personal consultation. To schedule your appointment, please call 310.273.0111 or complete our online contact form today. This entry was posted on Friday, April 28th, 2017 at 5:31 pm	and is filed under Bruxism, Dental Bonding, Porcelain Veneers, Sleep Apnea, Teeth Grinding. You can follow any responses to this entry through the RSS 2.0 feed. Both comments and pings are currently closed. The majority of people will chip a tooth at some point in their lifetime. Constant wear in a particular spot can weaken enamel until it breaks off. You might also bite down on hard food or be involved in an accident that chips and breaks your teeth. Whatever the cause, there are a few options Dr. Sands offers to repair chipped teeth so you can show off your smile with confidence. Treatment for a chipped tooth will depend on the extent of the damage and whether the chip is visible when you smile. If only a small amount of the enamel is missing or if the chip is on the front teeth, dental bonding can repair the damage in just one office visit. Also called a “filling,” since it fills the missing enamel with tooth-like composite resin, dental bonding is a quick and painless procedure that does not require numbing medication. The chipped area is etched so that the bonding material will adhere securely. An adhesive material is applied, then the composite resin is shaped on top of it to blend with the natural tooth and restore its shape. Once an ultraviolet light hardens the material, the procedure is complete. Larger chips, chipped teeth that have significant decay, or chips on the molar teeth may require a crown, which is a tooth-shaped cap that covers the tooth root. Crowns are made to be long lasting and are composed of metal, porcelain fused to metal, resin, or ceramic. Dr. Sands can help you determine the choice that best meets your needs with regard to cost, durability, and appearance. Usually it takes two office visits to install a crown. If needed, a root canal will be performed at the first office visit to build up the structure of the root so it can support the crown. X-rays will be taken, and any excess tooth will be removed. Your dentist will take impressions of the tooth receiving the crown as well as the opposing tooth so that the crown will line up correctly. You will go home with a temporary crown while your permanent one is made. At the second visit, the temporary crown is removed and the permanent one is cemented into place. Your teeth should line up seamlessly and look and function just as well as they did before. Porcelain veneers are another option for repairing chips on the front teeth. Veneers are thin shells of porcelain that cover the front of the teeth with a thick section that fills the chipped portion of the tooth. A single veneer can be used to repair a chip on one tooth, or the patient may choose to get veneers on all of their front teeth for a total smile restoration. 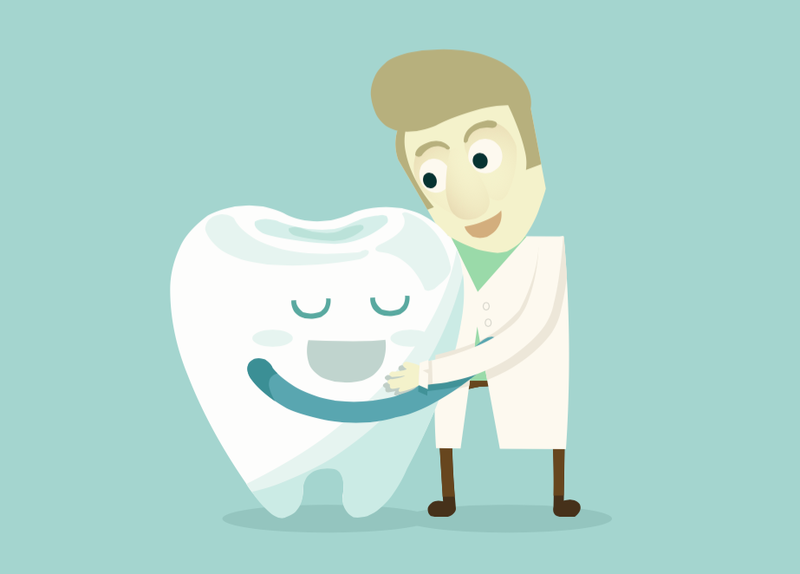 In just two office visits, veneers will not only repair chipped teeth, but they can also disguise gaps, perfect crooked or stained teeth, and improve your bite. During the first visit, the surface layer of your teeth is removed to make room for the veneer. Your teeth will be color-matched, and molds will be taken so the veneers can be made. Temporary veneers will be placed. At the second visit, the temporary veneers are removed, and the permanent ones are adhered with cement that is made permanent with ultraviolet light. If you have broken or chipped teeth, please schedule an appointment with Dr. Kevin Sands as soon as possible. He can quickly restore the function and beauty of your smile in as little as one office visit. Call (310) 273-0111 or fill out our online contact form today for more information. This entry was posted on Tuesday, January 3rd, 2017 at 11:18 am	and is filed under Cosmetic Dentistry, Crowns, Dental Bonding, Dental Care, Dental Problems, Dental Treatment, Porcelain Veneers. You can follow any responses to this entry through the RSS 2.0 feed. Both comments and pings are currently closed. A recent survey by The Health Policy Institute, a research division of the American Dental Association, found that the top three oral health problems facing Americans today are dry mouth, difficulty biting and chewing, and pain. Of the 15,000 survey respondents across all states, the top issue was dry mouth (also called xerostomia), with 33 percent experiencing it either occasionally or very often. Dry mouth can be a side effect of certain medications and some diseases. On occasion, dry mouth is not a concern, but chronic dry mouth can lead to tooth decay. Drinking more water is the first simple solution to the problem, but if that does not help, talk to your doctor about alternatives for your medications or a possible explanation for your chronic dry mouth. The next most common oral health problem was difficulty biting and chewing, experienced by 31 percent of those surveyed. Interestingly, this problem was more common among younger people and those with lower incomes. It can be caused by any number of dental issues, including crooked, cracked, loose, or decayed teeth. Prevention involves regular dental hygiene practices, such as brushing your teeth twice a day, flossing, and keeping your bi-annual dental cleaning appointments. Some people still experience these issues even when they take preventative measures. Dr. Sands can correct the damage with a number of treatments, including Invisalign®, porcelain veneers, and dental bonding. 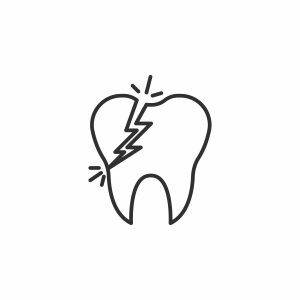 The third biggest oral-health problem was pain in general, experienced by 29 percent of respondents. Since any pain in the mouth can have many causes and solutions, it is best to always consult your dentist for prevention advice and treatment. Ignoring the pain or masking it with pain medication will not solve the underlying problem and could make it worse. It is always best to visit your dentist as soon as possible if you are experience tooth pain. Dr. Sands can help prevent and correct any of the above problems. Don’t delay your treatment; schedule your appointment today by calling (310) 273-0111, or fill out our online contact form for more information. This entry was posted on Saturday, October 1st, 2016 at 11:33 pm	and is filed under Dental Bonding, Invisalign®, Oral Health, Porcelain Veneers. You can follow any responses to this entry through the RSS 2.0 feed. Both comments and pings are currently closed. Am I Prone to Cavities? It is common knowledge that brushing your teeth, flossing daily, and maintaining your dental hygiene appointments will help keep cavities at bay. However, many people, despite their best efforts, may actually be more prone to cavities than those who slack on their oral hygiene. Why all the unfairness? There is no scientific proof to support the claim that regular brushing and flossing will prevent cavities. Tooth decay can be attributed to two things: the consumption of sugar and genetics. Cavities cannot exist without sugar. Bacteria in our mouths feast on sucrose (the chief component of sugar). The bacteria multiply and thrive between our teeth, causing decay in the process, which is more likely to occur if you have existing holes, small cracks, or deep crevices in your teeth. 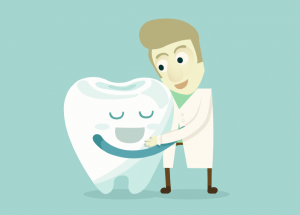 This fact brings us to our second cavity culprit and the answer to our main question: Am I prone to cavities? Some people naturally have deeper crevices in their teeth than others, which creates a more comfortable place for bacteria to burrow into the tooth and cause a cavity. This can be helped with the use of sealant, which Dr. Sands can apply to the grooves of your teeth to provide a protective layer. You might also be more prone to cavities if you do not produce much saliva. Your saliva contains bicarbonate, calcium, and phosphate, which help repair early tooth decay and neutralize acid that causes plaque. Certain medications can cause your saliva production to dwindle. Smoking, stress, aging, chemotherapy, and autoimmune disorders can also lead to dry mouth, or “cotton mouth.” Your doctor can help you find ways to increase your production of saliva if drinking more water throughout the day does not help. Although brushing and flossing daily is not proven to completely prevent cavities, it can decrease them by up to 20 percent if you use toothpaste that contains fluoride. Reducing your intake of sugar and carbohydrates (which convert into sugar in the mouth) will also significantly reduce your chances of getting a cavity. If the damage is already done, Dr. Sands can repair your cavities with dental bonding. If you would like Dr. Kevin Sands to help maintain the health and beauty of your smile, please schedule your appointment today by calling (310) 273-0111. You can also fill out our online contact form at your convenience. This entry was posted on Wednesday, September 28th, 2016 at 1:18 pm	and is filed under Dental Bonding, Dental Care, Dental Treatment, Oral Health. You can follow any responses to this entry through the RSS 2.0 feed. Both comments and pings are currently closed. Do you find yourself taking a sip of hot coffee or eating ice cream and clenching your teeth in pain? Ouch! Why do some people have teeth that are more sensitive than others? Having sensitive teeth can make it difficult to eat and exercise normal hygiene habits. The wearing down of teeth and tooth enamel can cause the teeth to be sensitive to hot or cold drinks and foods. Often, this can make brushing and flossing a painful chore and cause difficulties for those who suffer from sensitive teeth. Problematic tooth pain could be preventing a person from practicing normal healthy habits. By not giving the teeth the attention they need, they will only get worse. Getting rid of the pain associated with sensitive teeth starts with finding the source of the problem. There can be many factors that cause sensitive teeth. Someone who has healthy teeth will have a layer of enamel that protects the crowns of their teeth. The crown is the exposed part of the tooth above the gum line. Desensitizing toothpaste: Contains compounds that help block transmission from the sensitive tooth to the nerve. Typically, sensitivity will be reduced after several applications. Root canal: Treats the inside of the tooth for patients with severe or persistent sensitivity. Dental bonding: Used to correct a flaw or chip in the tooth that causes sensitivity. Fluoride gel: An in-office technique that involves the application of fluoride gel to strengthen tooth enamel and reduce the transmission of sensations. Surgical gum graft: This will protect the root in cases where gum tissue has been lost. If you have tooth pain, addressing it immediately is important for preventing other medical issues from arising. Do you have sensitive teeth and want the pain to go away? Dr. Sands can help you get rid of tooth pain. You can schedule an appointment by calling (310) 273-0111 or by filling out our online contact form. This entry was posted on Thursday, March 10th, 2016 at 6:22 pm	and is filed under Dental Bonding, Dental Problems, Sensitive Teeth. You can follow any responses to this entry through the RSS 2.0 feed. Both comments and pings are currently closed. A bright, beautiful, and healthy smile is often the goal when a person makes a trip to the dentist. It is no surprise that the teeth, as the center of the face, can affect the overall facial profile. An attractive smile is what everyone wants to achieve, so why not get it done in style? At the office of Dr. Kevin Sands, every patient can expect VIP treatment. We offer cutting-edge dental equipment in a relaxing and comfortable environment. You can have all of your dental needs addressed with Dr. Sands’ one-of-a-kind service. 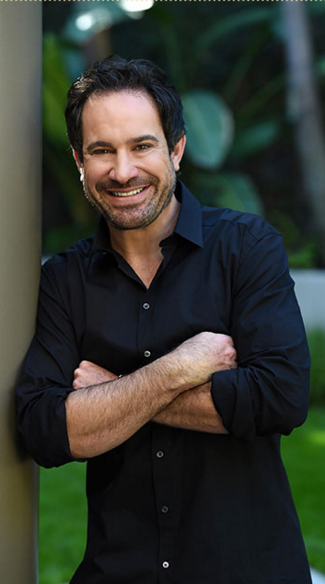 Known as the “premier dentist to the stars,” Dr. Sands is a groundbreaking dental artist; he creates beautiful smiles on famous faces in Los Angeles and Beverly Hills. For more than 15 years, he has provided patients with picture-perfect smiles. As one of the most sought-after dentists in the world, Kevin Sands has had patients travel from all over the globe to experience the Kevin Sands dentistry difference. At the dental office of Dr. Sands, patients can expect comfort and style, making their experience like no other. With state-of-the-art massaging dental chairs, digital imaging equipment, and flat screen televisions in every room, patients can receive overall dental care in a professional and relaxing environment. Our waiting rooms were made to provide patients with a relaxing experience. The walls, decor, and custom-made couches are designed to create a calming atmosphere for patients. Dr. Sands and his highly skilled staff can create a custom dental plan that will make you want to smile. He offers overall dental care, including cosmetic dentistry, and employs a number of techniques to help patients receive results that are not only beautiful but also reflect who they are. Have all of your dentistry needs met in style! If you are ready to experience the Kevin Sands difference, contact our office to schedule an appointment. You can schedule a consultation by calling (310) 273-0111 or by filling out our online contact form. This entry was posted on Thursday, February 25th, 2016 at 5:24 pm	and is filed under Dental Bonding, Dental Implants, Invisalign®, Porcelain Veneers, Sedation Dentistry, ZOOM!® Teeth Whitening. You can follow any responses to this entry through the RSS 2.0 feed. Both comments and pings are currently closed. If you’re like most people, you probably think that brushing and flossing are just for keeping those pearly whites healthy and beautiful. However, did you know that your oral health can affect the health of the rest of your body? Your mouth is an entryway into your body, so problems in your mouth can easily allow bacteria and other harmful germs to travel into your body and cause problems. So, while good oral hygiene can help keep your body healthy, not taking care of your teeth can have negative effects on your body. Bacterial growth in your mouth as a result of poor oral hygiene usually leads to inflammation of the gums (gingivitis), which often leads to gum disease as the bacteria in plaque builds up. Gum disease, also known as periodontal disease (periodontitis), is a chronic inflammatory condition that can have detrimental effects on the body. Gingivitis and gum disease allow bacteria to enter the bloodstream and lead to inflammation and diseases in the body. Gum disease is associated with multiple body issues and diseases, including heart disease, respiratory disease, osteoporosis, rheumatoid arthritis, premature birth, and diabetes. Diabetes also has a reciprocal relationship with gum disease; treatment of diabetes improves the condition of the mouth, and treatment of gum disease reduces the need for insulin. To prevent poor oral health and the negative effects it can have on the body, it is important to practice good oral hygiene. You should brush twice daily and floss at least once a day, preferably before bedtime, in addition to visiting your dentist for regular cleanings and checkups. There are also many benefits of chewing sugar-free gum for 20 minutes after eating and drinking. If you’re having an issue with your teeth, Dr. Kevin Sands offers a variety of services to help you maintain or improve your oral health, including porcelain veneers, Invisalign®, Zoom!® teeth whitening, dental implants, sedation dentistry, and dental bonding. If you would like to improve the appearance and health of your teeth, Dr. Kevin Sands can help. 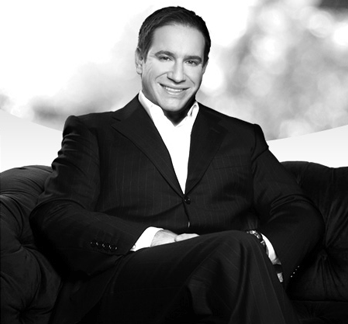 To schedule a consultation with Dr. Sands, please call (310) 273-0111 today. You may also fill out our online contact form for more information. This entry was posted on Friday, October 30th, 2015 at 10:53 am	and is filed under Dental Bonding, Dental Care, Dental Implants, Flossing, Invisalign®, Oral Health, Porcelain Veneers, Sedation Dentistry, Teeth Whitening. You can follow any responses to this entry through the RSS 2.0 feed. Both comments and pings are currently closed. Everyone wants to have a dazzling, bright smile, but damaged or deformed teeth can prevent your smile from displaying its full potential. Even worse is that these teeth issues may keep you from smiling so as not to reveal the unpleasant appearance of your teeth to the world. For patients who would like to improve or restore a brighter, more attractive smile, Dr. Sands offers dental bonding. In just one visit with Dr. Sands, he can restore beautiful, healthy teeth with a natural appearance. With such a quick and easy procedure, who wouldn’t want their dentist to bond with their teeth? Before starting the bonding process, a composite resin color is chosen that closely matches the color of your teeth. To prepare the tooth, Dr. Sands roughens the area that needs to be repaired by etching the surface. If tooth decay is the issue, Dr. Sands fills the cavity with a tooth-colored composite resin. Once the tooth is prepared, Dr. Sands applies a treatment of primers and gel that adheres the bonding material to the tooth. Then he applies the tooth-colored composite resin bonding and molds it into the desired shape. Once the bonding resin is molded and smoothed, Dr. Sands uses an ultraviolet light or laser to harden and set the material. He then performs any additional shaping if necessary, and applies a polish that matches the shine of the rest of your teeth. Although dental bonding is a great restorative procedure for correcting damaged, discolored, or misarranged teeth, the plastic bonding is not as strong as tooth enamel and is more susceptible to future damage. For a long-lasting solution to chips and gaps in the teeth, consider porcelain veneers. If you would like to restore confidence in your smile, schedule your consultation with Dr. Kevin Sands. Call our Beverly Hills practice at (310) 273-0111 or fill out our online contact form today. This entry was posted on Friday, August 14th, 2015 at 8:19 pm	and is filed under Dental Bonding, Dental Treatment, Porcelain Veneers. You can follow any responses to this entry through the RSS 2.0 feed. Both comments and pings are currently closed. A great smile is one of the best ways to show off physical attractiveness to others. However, a variety factors such as crooked or missing teeth or tooth discoloration could be preventing you from putting your best smile forward. Fortunately, our Beverly Hills practice offers a wide range of cosmetic dental procedures that will noticeably improve your smile and your self-confidence. 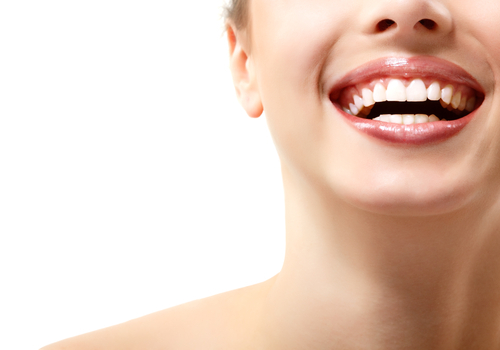 Teeth whitening is the most desired dental treatment around, and for good reason. With our state-of-the-art Zoom!® whitening system, your teeth can get up to eight shades whiter in just one visit. The procedure generally takes less than an hour to perform and involves applying a bleaching solution and a specialized light to your teeth. Even if you already have a decent smile, you may have one or more teeth that are slightly crooked or chipped. Dental bonding effectively treats these problems by applying a clay-like material to the tooth and hardening it with a specialized light to provide permanent results. Porcelain veneers are very popular among people with heavy tooth discoloration or staining. Using a porcelain composite that looks identical to the size and shape of your real tooth, veneers produce beautiful, natural-looking results. Hailed as the modern alternative to braces, you no longer need to wear metal wires and rubber bands on your teeth. Invisalign® improves your smile through a series of nearly invisible plastic trays that are customized to fit the contours of your teeth. As a highly respected cosmetic dentist, Dr. Kevin B. Sands D. D. S. strives to provide each and every one of his patients with the best results possible. As a dentist for some of Hollywood’s most elite celebrities, Dr. Sands looks forward to seeing you soon! To schedule your consultation with Dr. Sands, call our Beverly Hills practice at (310) 273-0111 or fill out our online contact form today. This entry was posted on Thursday, May 28th, 2015 at 12:03 am	and is filed under Cosmetic Dentistry, Dental Bonding, Dental Treatment, Invisalign®, Porcelain Veneers, Teeth Whitening. You can follow any responses to this entry through the RSS 2.0 feed. Both comments and pings are currently closed. Is It Bad to Grit Your Teeth? The muscles we use for chewing and speaking are some of the strongest muscles in our body. Four muscles in particular make it possible to speak, close our mouth, chew, and move our mandible (lower jaw) from side to side. When our mouth isn’t practicing any of these normal functions, the upper and lower teeth should rest comfortably together for the majority of the time. Sometimes, anxiety, anger, or sheer determination might cause us to clench our jaw or grit our teeth. While this is fine on occasion, habitual teeth clenching can lead to problems with the teeth, jaw, or overall health in the future. What happens when I grit my teeth? Most people who clench their teeth also grind their teeth. The term “bruxism” refers to both actions. While consistently clenching the jaw can cause some stress to the teeth, grinding the teeth together can lead to worse problems like cracks, chips, and loose teeth. It is very common for people to experience bruxism while they are asleep, having no idea that they are damaging their smile. Dr. Sands can easily tell if bruxism has been occurring when he examines your mouth at a routine dental visit. If any damage has occurred, he may recommend dental bonding or a much stronger alternative like porcelain veneers to keep up with the consistent damage. He can also customize a mouthguard to be worn at night to help protect your teeth. What other damage can teeth clenching cause? Since one of the muscles responsible for bruxism, the temporal fossa, extends all the way into the skull, its overuse can be a cause of recurrent headaches and earaches. “Lockjaw” is also a side effect of bruxism because of the muscle spasms and temporomandibular joint (TMJ) inflammation it can cause. How do I cure bruxism? Reducing stress and avoiding food that can be hard to chew, such as toffee, caramel, or steak, will help to relax the overworked jaw muscles. You should also avoid chewing gum and opening your mouth very wide on a consistent basis. Dr. Sands can provide further recommendations for treatment for bruxism during your consultation. If you are experiencing bruxism or its side effects, Dr. Kevin B. Sands can assess your mouth and provide his recommendation for treatment. To schedule an appointment, please call us today at (310) 27-0111 or fill out our online contact form. This entry was posted on Tuesday, September 16th, 2014 at 8:00 am	and is filed under Bruxism, Dental Bonding, Dental Problems, Porcelain Veneers. You can follow any responses to this entry through the RSS 2.0 feed. Both comments and pings are currently closed. Whether you’ve been on just a few dates or you’ve been married to your sweetheart for years, Valentine’s Day has granted us all the moral obligation to step up our romantic game. Come February 14th, men everywhere are frantically buying flowers, chocolates, jewelry, or booking last-minute dinner reservations – all to impress that special lady in their life. Unfortunately, even with all the elaborate plans and gifts, a lot of people forget the most important part of the night: the kiss. Even if everything goes right on a Valentine’s date, a poorly planned kiss can put quite a damper on the romantic mood. To ensure the most memorable evening possible, we’ve gathered some of the top things to do to make your kiss count this Valentine’s Day. A great way to prepare your lips for a good kiss is to warm them up by smiling often. Smiling throughout the date will not only help alleviate any nervous tension for you, but it will put your significant other at ease as well. Plus, studies have shown that those who smile often are more successful in many areas of life compared to those who don’t. Why not put the odds in your favor? If you’ve ever heard of the 90/10 rule, you know that at the end of the date, in order to get that perfect kiss, the man should lean in 90 percent, and his date should meet his lips with the remaining 10. This tactic is not overtly forward, yet forward enough to let the lady know exactly what he’s after. It works like a charm. That is… unless he has terrible breath. A mint will surely help disguise that garlic broccoli dish you just enjoyed, but taking care of your oral hygiene on a regular basis will set you up for success in the long-term. Be sure to brush your teeth twice daily (and once more before the date for good measure). Floss regularly, and visit your dentist every six months to lower your chances for chronic bad breath, tooth decay, gum disease, and causing your damsel to faint when she’s in close proximity to your mouth. Teeth Whitening: Teeth whitening is one of the most cost-effective ways to improve the appearance of your smile overall. Zoom!™ is offered in-office for same-day results that can make your teeth appear up to eight shades whiter. We also offer customized bleaching trays for patients to take home. Results can be seen within a couple of weeks of continued use. Bonding: Dental bonding can repair any cracks or chips in the teeth. The procedure is quick and painless, and many patients are surprised at how much their smile and overall confidence improve when even a small area is corrected. Porcelain Veneers: Porcelain veneers can do what teeth whitening and bonding can, plus much more. Thin sheets of porcelain are applied over the teeth to mask discoloration, chips, cracks, gaps, and crooked teeth. They are usually applied to the front upper teeth that show when you smile. When it comes to impressing your one-and-only, these are the teeth that count the most! If you are interested in one or more of the many dental services offered at our Beverly Hills practice, please schedule an appointment with Dr. Kevin B. Sands. Call (310) 273-0111 today, or fill out our online contact form for more information. This entry was posted on Thursday, February 13th, 2014 at 10:20 pm	and is filed under Cosmetic Dentistry, Dental Bonding, Porcelain Veneers, Teeth Whitening. You can follow any responses to this entry through the RSS 2.0 feed. Both comments and pings are currently closed. What Dental Work Can Be Undone? While permanent dental treatments can definitely be a positive thing, many people are intimidated by the idea that their procedure cannot be reversed if they are unhappy with the result. Especially when the treatment is for cosmetic purposes only, the patient should do their homework and understand what they can expect with the procedure. Choosing a dentist that has plenty of successful experience can also put your mind at ease. As we mentioned in a previous post, if you lose a tooth or get one extracted, there is a window of time that your tooth can be reinserted into the gums to function as if it had never been missing. However odds are, if you visit the dentist to have a tooth removed, there was a good reason to do so. A crown with a dental implant can replace the missing tooth to function and look just like its natural predecessor. Bonding is used to repair chips in the teeth. Since dental bonding can slightly become discolored over time, many wish to get it replaced or removed. This can easily be done with a drill. A very small amount of surrounding enamel may be removed as a result, but high magnification of the area helps to avoid this. Any enamel that is removed can be easily replaced with the new bonding. Many dental procedures cannot be reversed because they are meant to have long-lasting or permanent results. However, these treatments may be improved or modified if anything goes wrong or if regular wear and tear has compromised the prior results. Because a significant amount of the tooth must be removed in order to place a crown or “cap” over its basic structure, crowns should not be removed without being replaced. If the patient gets a chip in their crown, many times the dentist can “smooth out” the chipped area rather than replacing the entire crown. Crowns are long-lasting, but sometimes, usually after a period of many years, the cement that holds the crown in place can deteriorate from constant exposure to saliva. This will weaken the bond and may require a replacement if the prior crown cannot be used for any reason. Dental implants are titanium rods that are inserted into the gums and are capped with a crown. The implants literally fuse with the jaw bone, creating a bond that can be even stronger than a natural tooth root. The need to remove an implant is very rare, but possible if necessary. Most often if a problem occurs with an implant, the problem really exists with the crown that is secured on top of it, which can be easily corrected. Implants, on the other hand, are more difficult to remove. Older techniques involve cutting the jawbone, and therefore removing a small amount (about 1 mm) of surrounding bone. Implants can also be removed with the use of a special implant removing device. The implant itself should last a lifetime and is a more sturdy alternative to a crown restoration secured to the natural tooth root. Since the application of porcelain veneers involves smoothing down the tooth’s surface about 1.5 mm, veneers are considered an irreversible procedure. Patients can get their veneers removed without being replaced, but the teeth will not look aesthetically pleasing, and they will not likely function as well as natural teeth. If a chip or crack occurs in a veneer, the entire veneer must be replaced. With years of experience as a celebrity cosmetic dentist, Dr. Kevin Sands holds a strong reputation as one of best dentists in Beverly Hills. If you are considering a cosmetic dental procedure but are a little apprehensive, a consultation with Dr. Sands will help alleviate your concerns. Please call (310) 273-0111 today, or fill out our online contact form to schedule an appointment. This entry was posted on Thursday, February 6th, 2014 at 12:20 am	and is filed under Crowns, Dental Bonding, Dental Implants, Dental Treatment, Porcelain Veneers, Tooth Extraction. You can follow any responses to this entry through the RSS 2.0 feed. Both comments and pings are currently closed. Would You Rather Have a Perfect Body or a Perfect Smile? According to new research from the American Academy of Cosmetic Dentistry (AACD), consumers are more likely to spend money on a younger looking smile than on weight loss help. 1. Since the smile is one of the first things people notice about another person, making a small improvement, such as teeth whitening or bonding a chipped tooth, can significantly make someone appear more youthful. Friends may notice that something about you has improved, but they may not be able to determine just what it is. 2. Replacing missing teeth with dental implants literally makes the face appear more youthful. When missing teeth are not replaced, the patient is very likely to experience facial bone loss as time progresses. This can alter the shape of the face, making the jaw appear smaller. Not only do they fill in missing teeth, but dental implants actually prevent bone loss because of the way they are installed. 3. Although we would not discourage healthy weight loss, losing weight can actually make one appear older. When volume is lost, those who have poor skin elasticity will develop more wrinkles, especially on the face. A recent study comparing twins of different weights showed that the thinner twin almost always appeared older than the heavier twin. Spending money on weight loss tools or programs may help you become physically healthier, but they should not be your first choice if looking younger is your goal. At Dr. Sands’ practice, we agree that maintaining a healthy and beautiful smile is a worthwhile investment. Invisalign® is a particularly great treatment to correct crooked teeth since the straightening trays are virtually undetectable. Porcelain veneers can also correct crooked teeth, as well as broken, cracked, or chipped teeth. Dr. Sands offers many cosmetic dental procedures that can improve the overall appearance of your smile. If you would like more information about how to take years off your appearance with cosmetic dentistry, please call (310) 273-0111 or fill out our online contact form to schedule a consultation. This entry was posted on Tuesday, November 26th, 2013 at 8:00 am	and is filed under Dental Bonding, Dental Implants, Invisalign®, Porcelain Veneers, Teeth Whitening. You can follow any responses to this entry through the RSS 2.0 feed. Both comments and pings are currently closed. Kevin B. Sands, D.D.S. grew up in Beverly Hills and became accustomed to seeing movie and TV stars driving, walking, and just enjoying life around town. When Sands became a dentist, the trend continued – at his office. He now sees so many celebrities and notables in his practice for various dental treatments that he has become known as the dentist to the stars. Recently, Charlie Sheen, Robert Downey, Jr., Denise Richards, Halle Berry, Britney Spears, and a visiting potentate from the Middle East brought their smiles to Dr. Sands for tune-ups and other treatments. Of course, his patient load is also filled with we ordinary mortals of all ages who come seeking a better, whiter smile. Common repairs include teeth whitening, dental bonding, and porcelain veneers, his specialty. Those veneers are handled quickly – usually within two weeks — because Dr. Sands has a lab at his practice. “A new smile brings tremendous confidence to a person,” states Dr. Sands., “Some guys come in with teeth that need work, get a new smile and then the next thing you know, they are married,” states Dr. Sands, who offers a warranty with each procedure. Plus, there’s a lot more to do than leaf through old issues of Time and Newsweek while you wait. Instead, Dr. Sands’ office offers in-office foot massages and DVDs on flat-screen television to help pass the time. While Dr. Sands routinely handles cosmetic dental procedures like teeth whitening, dental bonding and tooth bleaching, his specialty is porcelain veneers. The procedure starts when a patient notices he or she has uneven, misshaped, chipped, or discolored teeth, or a smile that has a gap in the front teeth. A porcelain veneer is a thin shell of porcelain that fits over the existing tooth. Porcelain offers several advantages – it is extremely durable and has color, translucence and texture that are similar to natural tooth enamel. Moreover, porcelain won’t decay or stain, nor does the procedure require braces. Installing porcelain veneers starts when the dentist examines the patient’s teeth and gums, takes a medical history, and perhaps a few photos to compare to the final results. Next, the dentist takes a full mouth impression after roughening and shaping the enamel on the existing teeth, which have been numbed via a local anesthetic. The patient leaves the office with temporary veneers covering his prepared teeth while the customized veneers are being completed in the lab. The procedure is relatively pain free. During the final appointment, the dentist checks the fit, size, and color and makes any necessary corrections. Before cementing the veneers permanently, teeth and gums are thoroughly cleaned because clean teeth and healthy gums are necessary for the appliance to bond. Applied veneers feel just like natural teeth but are not indestructible. The dentist will ask you to avoid biting down on hard substances and to slice apples before consuming them. Costs depend on general economic conditions in your area but usually range from $700 to $2,000. Whitening agents can brighten a smile dimmed by stains brought on by coffee, dark sodas, cigarettes, medication, or aging. The procedure produces instant results and is done by placing a special gel on the teeth and then using a laser to activate the substance. The procedure takes one to two hours and, while the results often last for years, the treatment does not work for fillings, crowns and past bonding. Some stains can’t be removed by bleaching. This procedure also restores chipped or broken teeth, fills in gaps and brightens the smile. To start, the dentist uses a special acid to roughen the surface of the tooth. Dental resin is then applied and shaped; a high-intensity light hardens the compound and seals the tooth enamel. The dentist then contours the bonding material to the shape of your tooth and polishes it. The procedure does not require anesthesia and usually lasts five to ten years. Implants feel like natural teeth because implants are substitute teeth permanently anchored to your jaw. Implants are most often used to replace ill-fitting dentures or missing teeth. If you are interested in any cosmetic dental procedure, please schedule an appointment with Dr. Kevin B. Sands by calling (310) 273-0111. For your convenience, you may also fill out our online contact form. This entry was posted on Tuesday, August 17th, 2010 at 8:11 am	and is filed under Cosmetic Dentistry, Dental Bonding, Dental Implants, Dental Treatment, Porcelain Veneers, Teeth Whitening. You can follow any responses to this entry through the RSS 2.0 feed. Both comments and pings are currently closed. Request an appointment for a consultation with cosmetic dentist Dr. Sands, or feel free to call our Los Angeles (north of Orange County) office at (310) 273-0111 for more information.